Listing+ comes with a custom Google Maps and Views integration, which provides directions and more info on any entered Property, with a single click. 13 carefully selected, awesome color schemes to choose from: Gray and Blue, Green, Orange, Red, Pink, Purple each of which in two different versions. Just pick the one that fits your brand with a single click through the theme-settings. Enjoy View blocks and pages based on Bootstrap Grid ready-made for your ease: Agents, Properties of Agent, List of Properties, Google Map with Properties, Popular Tags, Slideshow Boxed / Full Width, Testimonials, Twitter Updates and yet much more. 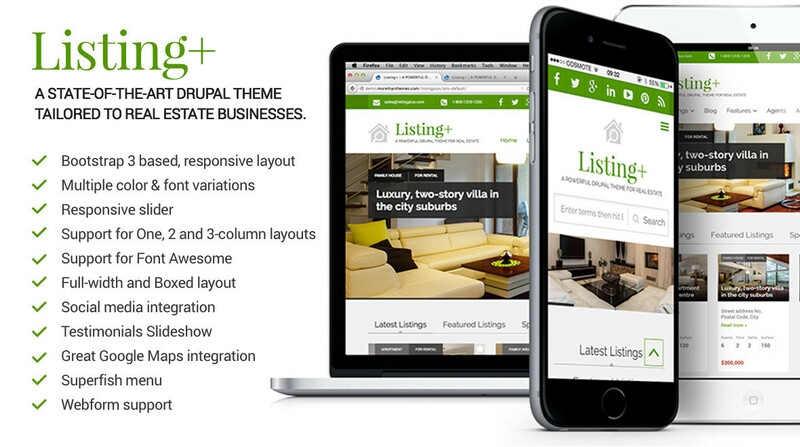 Listing+ comes with a Property Agent content type, again, specifically designed for real estate. The Agent content type includes fields featuring all the information necessary under real-life circumstances. Choose whether you want a full-width or a boxed layout, with just a single click from the theme settings. Both look and function great, so it’s all about your goals and preferences. Listing+ integrates with the Superfish module supporting gorgeous multi-level drop-down menus with smooth motion. *The pre-activated blog is available only when the built-in installation profile is used.